If you’re losing your hair and want to be pro-active about it, you’ve really only two options: either start wearing good quality wigs, or go for a hair transplant. Cover photo: the author (second from the left) with his hair band mates, circa 1980-something. I once played in a rock and roll band with a poor guy who’d lost almost all his hair before he’d even turned 20. I swear, not a day went by that poor ‘ol Paco (not his real name because I’m sure he still wouldn’t want me exposing his secret to the world – even all these years later) didn’t at least once complain about his lack of hair and how miserable and inferior he felt because of it. There’s no doubt in my mind that Paco would have been a very different person had he not gone bald at such a young age. A much more content, relaxed, maybe even happy person. He certainly would have been a more interesting conversationalist, because seriously, as empathetic as his friends and band mates were to his condition, being on tour for months at a time, all cooped up in a van with a guy constantly whining about being bald gets pretty tired after six years or so. When Paco turned 27, however, an old friend of ours from the ‘hood started making a lot of money selling used car parts. Anyway, Danny (his real name – he skipped town years ago so it doesn’t matter anymore) had also tired of Paco’s constant crying about being bald, and flush with more cash than he knew what to do with, finally told Paco he’d give him $2,000 to get a transplant or weave or however much hair those dollars could buy him, on the condition that he never speak of being bald again. Paco, of course, was absolutely thrilled, and wasting no time researching his options, ultimately settled on securing a specialized wig that would be permanently weaved into his few existing hairs. He’d have to return to his hair care specialist every few months to have the weave tightened, but it seemed the best option for his money. Ah, but it wasn’t. In fact, it turned out to be 2,000 very poorly spent dollars. The first wig they weaved into his skull could’ve been a joke, it certainly spawned enough laughs. It couldn’t have looked more fake or ridiculous. Fittingly, Paco was pretty bummed by the whole ordeal, but when he went back to the hair restoration company to complain, to his great surprise they immediately apologized and offered to build another, less outrageous weave for him. Paco’s second hair weave/wig was much better. It looked real enough and within a week or two seemed perfectly natural atop his head. I’d known Paco for ten years by this point and never seen him so happy. He was a different guy, and with his newfound confidence in check Paco started charming the ladies like nobody’s business. For the first month or two everything was wonderful. Except increasingly Paco’s hair weave started moving around on his head, looking very, very fake when it did. Danny had agreed to give Paco the money for the initial treatment, but wasn’t about to start paying bi-monthly maintenance fees, which were fairly expensive, or more money than Paco had to spare, at least. Consequently, Paco could only afford to get his weave tightened once or twice a year, which meant he had to go back to wearing hats 24/7 again just to keep his new hair in place. Paco could only afford to get his weave tightened once or twice a year, which meant he had to go back to wearing hats 24/7 again just to keep his new hair in place. The situation only kept deteriorating, and within two years Paco’s weave was balding on him as well. Hair particles were falling out all the time, forever leaving the poor guy with fresh new bald patches to try and hide. But this time when he went back to the company to complain they essentially told him “tough luck”, his guarantee had expired. They would, however, sell him a replacement wig for only $1,000, a special deal for returning customers. Paco was livid but there wasn’t much he could do about it. Finally, one summer day while knee-deep in a country stream fly-fishing, a great gust of wind blew Paco’s $2,000 worth of hair clear off his head and straight into the drink, where it rapidly proceeded to float downstream. Charging as fast as he could Paco was able to retrieve the weave before it disappeared for good, and promptly threw the stinky wet mess into his tackle box and never looked back, resigned to the fact that he obviously just wasn’t meant to have a full head of hair. It had to be God’s will. He shaved off the last of strands that year and has been a skinhead ever since. He now says he’s finally accepted his condition. He just turned 60. I’m relating Paco’s sorry tale to you because it’s indicative of the innumerable hustles designed to relieve the balding of their money throughout the ages. In Paco’s case, he simply purchased an inferior product – no doubt there are reputable hair replacement centers who sell better quality products – but never lose sight that many, many sharks lurk in the waters where bald men swim. You’ve probably heard a zillion different things that are supposedly responsible for baldness: poor circulation, vitamin deficiencies, wearing too many hats. It’s all nonsense, as is so much information about hair loss. While yes, there can be other factors involved, overwhelmingly the problem is hereditary, usually in conjunction with aging and the change in hormonal balance that comes with it. The earlier in life hair loss begins, the more severe the balding is likely to be. And sorry to disappoint, but there are no pills or tonics or shampoos or exotic plants that reverse the process of balding. Even the much ballyhooed minoxidil (aka Rogaine) and finasteride (Propecia) have demonstrated limited results, with minoxidil in particular only marginally effective on a small minority of people given the drug. So if you’ve lost or are losing your hair and want to be pro-active about it you’ve really only two options – either start wearing good quality wigs, or go for a transplant. If you can afford it, the latter is by far the best way to go. And once it’s done, there’s no looking back. So long as the balding process has come to an end, you’ll have a full head of hair for the rest of your days. The most important thing to remember when considering any cosmetic surgery is to make sure the doctor you choose is board-certified. This isn’t the usual hyperbole but something that can’t be emphasized strongly enough. For starters, there’s a variety of procedures to choose from when it comes to hair transplants, not all of them of equal efficacy. In fact, there are plenty of procedures you actually want to avoid that are still commonly performed by less qualified, or ethical, practitioners. Most of them are outdated but still routinely conducted without the best interest of the patient in mind. I won’t go into detail about every single bogus hair replacement option being offered today because if I did we’d still be here tomorrow, but the following are all, categorically, bad and/or potentially dangerous options you absolutely want to avoid to treat simple androgenetic alopecia, aka male pattern baldness. The first hair transplant in the United States took place in 1952 and was immediately deemed a success. Over the next several decades the results of these procedures tended to be uneven, with enough horror stories to go around to give hair transplants a bad name. This was the situation until the mid-1990s, when the advent of follicular unit micro grafting/follicular unit transplantation turned hair transplantation into the reliable, virtually undetectable option for hair loss sufferers it is today. In 2016 it is still the only tried and true procedure that’s virtually guaranteed to grow genuine hair on your head. 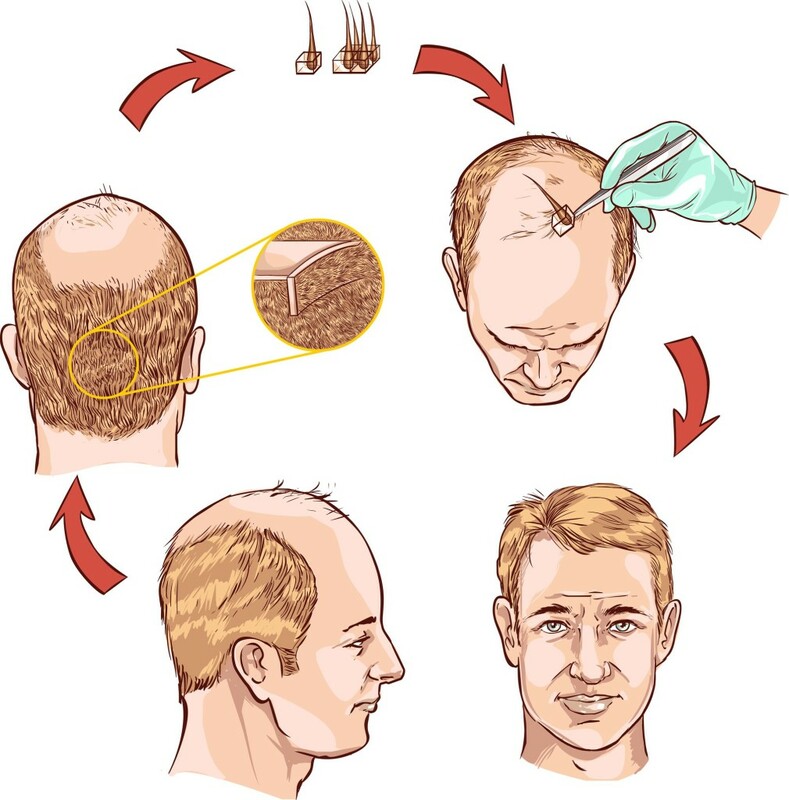 Hair transplantation involves removing small pieces of hair-bearing scalp grafts from a donor site, usually at the sides and back of your head, and relocating them to a bald or thinning area elsewhere on your dome. These days hair transplants are generally performed in a doctor’s office. After cleaning your scalp and applying a local anesthetic to the back of your head, your doctor will follow one of two methods for the transplant: follicular unit strip surgery (FUSS), or follicular unit extraction (FUE). Over the past decade FUSS has been considered the “gold standard” of hair transplants, but in recent years FUE has surged in popularity. Each method has its pros and cons. The more common FUSS method is performed by removing a 6-10 inch strip from the back of your head, putting it aside, and sewing you back up again. The doctor will then take that strip and divide it into hundreds – or thousands – of tiny grafts and, after taking a scalpel and creating a series of holes in the area being treated, gently deposit each one of these grafts in the corresponding hole. You can expect the procedure to take anywhere from 4 to 8 hours. The FUE method involves the doctor shaving the back of your scalp and removing the hair follicles individually before inserting them in their new location. While the FUE procedure has it’s own downsides; it’s more expensive, has a less impressive rate of hair regrowth, and can sometimes involve two consecutive days to complete, it has one main advantage: it leaves no scarring, so if you decide to shave your head someday, well, nobody will know your secret. Your scalp will feel very tender for the next several days and may require pain medication until the pain subsides. Although your head will be be bandaged for a couple of days post-op, you might also be prescribed antibiotics or an anti-inflammatory to guard against infection. Don’t expect to be able to go back to work for 2 or 3 days at best. After a few weeks the transplanted hair will fall out, but a few months later you’ll start seeing new growth, and within six to nine months can expect to have 60 percent of your new hair on your head. Depending on the method and how much hair is being transplanted you can look to spend anywhere from $4,000 to $15,000 to have a full head of hair again. And even if that does sound like quite a chunk of change, if you’re as freaked out about baldness as Paco was back in the ’80s, it could well be the best money you ever spend.